Pack of 100 Certificates - Penn Central Railway Company - Price includes shipping cost in U.S.
Home > Certificate Quantities for Educators / Business Promotions > Pack of 100 Certificates - Penn Central Railway Company - Price includes shipping cost in U.S. 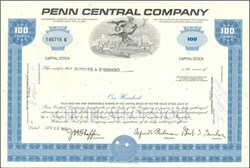 Beautifully engraved stock certificate from the Penn Central Railway Company dated no later than 1973. 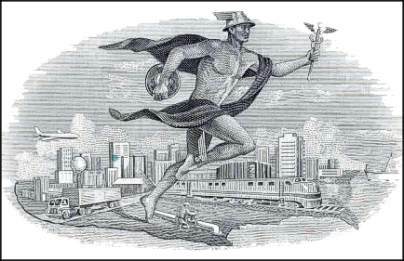 This historic document was printed by the Security Columbian Banknote Company and has an ornate border around it with a vignette of the Greek God Mercury running with a train, airplane and city in the background. This item has the printed signatures of the Company�s Chairman of the Board. Mixture of colors include Blue, Red, Brown and Gold.